A Canadian man has been "pardoned" by a luxury hotel after his room was ransacked by a flock of pepperoni-loving seagulls nearly two decades ago. Nick Burchill was banned by the Fairmont Empress in Victoria, British Columbia, after "a string of unfortunate events" in 2001. In a Facebook post, the Nova Scotia man described bringing some pepperoni to naval buddies on the west coast. The problems began when he decided to cool the meat on the hotel windowsill. The "Brother's Pepperoni" - a Halifax delicacy - had been kept at room temperature for a short time, Mr Burchill wrote in a widely shared social media post. He thought it would be best to make sure it was refrigerated. But the fourth-floor room had no fridge. Still, it was April, the air was chilly, and his front-facing room had a window. "I lifted one of the sashes and spread the packages of pepperoni out on the table and windowsill. Then, I went for a walk…for about 4 or 5 hours," said Mr Burchill. 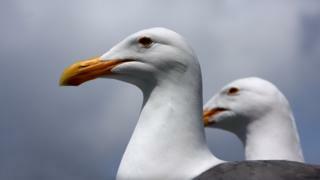 On his return, he found about 40 seagulls - "an entire flock" - in his room. They had been eating the pepperoni, which "does NASTY things to a seagull's digestive system". The startled birds "immediately started flying around and crashing into things as they desperately tried to leave the room through the small opening by which they had entered," Mr Burchill said. "The result was a tornado of seagull excrement, feathers, pepperoni chunks and fairly large birds whipping around the room. The lamps were falling. The curtains were trashed." He waded through the birds and opened all the remaining windows. In his "agitated" state, he threw a shoe at one confused bird who tried to fly back into the room. Both shoe and seagull went out the window. Finally, only one large seagull, with pepperoni still clasped in its beak, remained. "In a moment of clarity, I grabbed a bath-towel and jumped it," he said. Both also went out the window. The shoe and the towel-wrapped - but unharmed - seagull landed on visitors arriving for afternoon high tea at the hotel. At that moment Mr Burchill realised he had just a few minutes before he had to attend an important business meeting - and only one shoe. He recovered his mud-covered shoe from outdoors and washed it, but a hair dryer mishap as he tried to dry it knocked out some of the power in the hotel. He finally admitted defeat and called housekeeping for help in cleaning the mess. "I can still remember the look on the lady's face when she opened the door," he wrote. "I had absolutely no idea what to tell her, so I just said 'I'm sorry' and I went to dinner." Soon after, his company received a letter saying he was no longer welcome at the hotel. In March, he sent a letter to the hotel requesting a pardon from his lifetime ban, and asked them to consider the last 17 years as "time served". The hotel confirmed to the Times Colonist newspaper that Mr Burchill's wild tale was true and well-remembered by longtime staff. "It's one of those things where you can't make this stuff up," the Empress's director of public relations told the newspaper. Mr Burchill's pardon was granted.